Having one baby is great, but having two is even better! Well, having them is better, but having to take care of them can be a little difficult. No matter if you’re a first time parent with twins or if you already have a child or two, taking care of twins can be difficult. The good thing is you will figure out the most efficient ways to take care of them. One of the most life-saving pieces of equipment that you can have is a baby video monitor to watch over your twins. Manufacturers don’t necessarily make baby video monitors designed specifically for twins, but some do have features that will help tremendously. For one, you’ll want to get a baby video monitor that has a wide view angle and the ability to pan and zoom throughout the room. 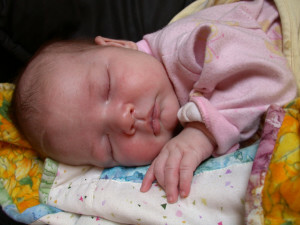 When your twins are in the infant stage, they won’t be moving around much. But that will only happen for the first couple months. After that, you will be glad that you have a baby video monitor that can help you see a larger space at one time. There are some other additional features that could come in handy, which you will likely get if you purchase the wide view baby video monitor. Being able to view your children on the widest screen possible is crucial when you have two kids to look at. Some video baby monitors have screens as large as 5″, which is almost a necessity when you have twins. You may also wish to be able to view the camera on your mobile device, which is also an option for certain models. For the first couple months of your twins lives, you’ll probably be right there with them at all times. Eventually, though, you will have to loosen the cord a little bit and let them rest and play on their own. That’s where the baby video monitor comes into play. You can still keep an eye on them, but they won’t even know you’re watching them. Parents use baby video monitors for a variety of reasons, but one of them could be to teach your children that you as the parents don’t have to be present at all times. Twins can really gang up on you at times and want more attention than the other. With a baby video monitor, you can watch them in their cribs. If they are crying just as a way to receive attention, then you can choose to handle it however you want. But if they are crying because something is wrong, then you will be able to see that as well. If you have twins, you’re going to need to spend a little extra time on deciding which baby video monitor to buy. Luckily, you can narrow down your options a little better since you know that you’ll need some specific features. Here is our top choice of baby video monitors for twins that you can consider. 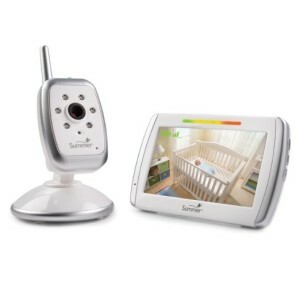 With this video baby monitor, you will enjoy one of the largest color LCD screens at 5”. But the best thing about it when it comes to having twins to keep an eye on is the wide view of the camera angle. It will allow you to view up to four times more of the baby’s room than a normal video baby monitor, which is essential when your twins start becoming mobile. When you’ve got two babies that like to move around, the last thing you want to worry about is moving around the camera to get the best view. With the wide view angle of this Summer Infant video baby monitor, you can set it up once and not have to worry about moving it around. Plus, it gives you the ability to zoom in if you need to! This is one of the best models of video baby monitors that you can buy if you have twins, but as long as you find one with the features discussed here, then your life will be much easier!